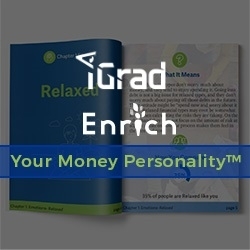 San Diego, CA, March 29, 2019 --(PR.com)-- Because personality type directly influences how people handle their finances, San Diego-based financial wellness company iGrad has launched the first financial wellness assessment to teach the “why” behind financial decision-making and recommend personality-based positive changes. This financial behavior assessment is now available on the iGrad and Enrich Financial Wellness Platforms. Developed by leading financial wellness and behavioral economics experts, Your Money Personality™ incorporates a personality test that is similar to the Myers-Briggs Type Indicator® (MBTI®) by assessing financial behaviors across a range of categories, including outlook, emotions, focus, influence and bonus. It helps users understand each component of their money personality, including dominant traits, strengths and challenges - an understanding that is essential to making long-term changes.